Awaken Your Ageless Authentic Body Size and Your Higher Life Purpose! How to manifest abundant unlimited energy, an ageless body, permanent health, and an authentic body size signature of your higher self or soul you were meant to have. How to anchor more of your authentic spiritual body into your physical body to awaken hidden talents and channeling your life purpose. HOW TO AWAKEN YOUR AGELESS AUTHENTIC BODY SIZE AND YOUR HIGHER LIFE PURPOSE! Many people are lacking the fullest expression of their radiant ageless authentically sized bodies and disease free energy filled bodies. Many don’t know there are principles to follow to fine tune the body to align itself dramatically shut down the aging process, reconnect back to your authentic smaller body size and get rid of all disease. When you connect back to that alignment your automatically more aligned with your higher life purpose and channeling that. If you answer yes to any of the following, this video training series is for you! Do you feel like you can’t be thin without being fully nourished? Do you struggle with health problems or your skin doesn’t look youthful? Do you struggle with being tired and feeling like you have to eat all the time because you feel hungry all the time? Do you feel a lack of clarity in your life purpose and wonder if The Butterfly Diet™ can awaken a higher clarity in channeling your life purpose? How to manifest abundant energy, an ageless body, and permanent health, and an authentic body size signature of your higher self or soul. REGISTER NOW: E-Book & FREE MUST-WATCH 4-PART VIDEO TRAINING SERIES! 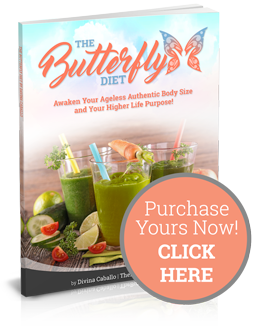 Divina’s unique take on Reawakening Your Authentic Body through The Butterfly Diet™ allows you to heal in mind, body and soul. This program is Equipped with so many powerful, practical and straight forward lessons, this program allows you to walk confidently along the route your true ageless and authentic body size as well as your soul desires/life purpose. Living from our authentic Body, is life changing. When you embrace the part of you that is already perfect, whole and complete everything falls into place. Divina shows you how to do just that. This program is a must! Before working with Divina, I had a lot of insecurities and lack of confidence and energy on a physical level. Then after working with Divina with The Butterfly Diet™ in my health in my physical diet and I was impressed with the information she offered in this part of the program which was different than anything I offered. It was so instrumental in giving me energy and the mindset part of the program was important to help me stay centered in my new diet changes that affected my expression of my life purpose. The spiritual aspect of the program helped me awaken creativity levels I never new possible especially as a musician. Divina, #1 International bestselling author of Reawaken Your Authentic Self and The Butterfly Diet™, is a certified nutritionist, business consultant and the founder of Reawaken Your Authentic Self Academy, a program that helps individuals maximize their talents and life purposes to their fullest potential so they can generate an abundant lifestyle. One of the gateways that are taught in the academy is a 2-year process raising consciousness with the butterfly diet to awaken a higher life purpose. The academy is all about teaching people how to reawaken their authentic selves to get ahead in their personal and professional lives. After a period of six years of intensely following the teachings of The Butterfly Diet™ and the other practices written in her book Reawaken Your Authentic Self and used in her academy programs, Divina experienced a profound transformation where the essence of her highest self merged back into her physical bod y and awakened her life purpose as a successful artist and fashion designer. Since then, she has dedicated her life to reawakening others into their authentic selves so they can realize their dreams through their own unique gifted talents and messages. © Copyright 2015-2016. The Butterfly Diet. All Rights Reserved.